OPELIO :: Products :: :: Seventh Dimension Design, Inc. Simply use your fingertip to record, play, and edit video footage from surgery or tests.The OPELIO system transmit and share video throughout the hospital in real time or on demand. High-resolution touch panel enables intuitive recording, playback, and editing. 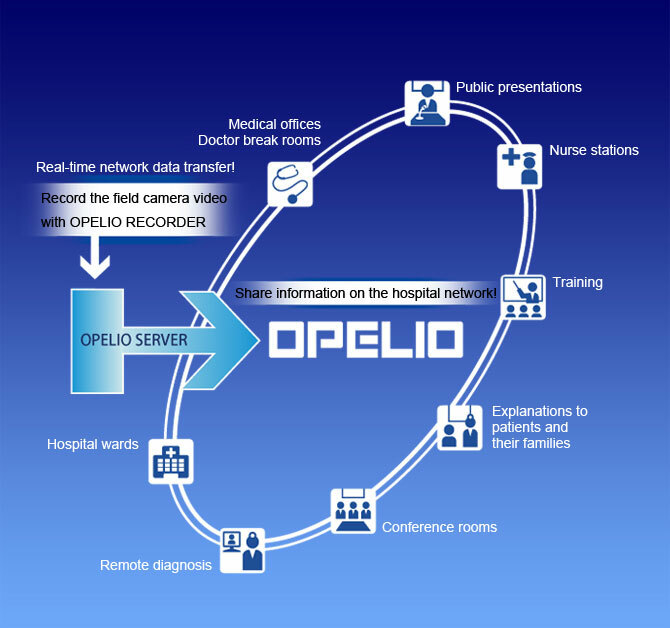 The OPELIO system is capable of importing video from surgery or tests, saving them as video or still images, and distributing them to other sites within the hospital. The unique user interface is optimized for touch panel operation, enabling anyone to perform operations such as selecting patient information, recording, playback, extracting still images, simple editing, and data transfer to a server, all done simply with just one finger. Sharp, high-definition images can be utilized in clinical settings without getting in the way of medical procedures. Video from surgery taking place in an operating room can be viewed in real time via a PC web browser on the hospital network. Of course, video data already saved on a server can be searched using a web browser and viewed, edited, or downloaded. In addition to making medical treatment clear and understandable by providing visual information to patients and their families, these functions can also be used for training and research applications. The system can connect with hospital information systems such as HIS/PACS and anesthesia management systems. In addition to acquiring patient information, it is also possible to connect with a wide range of medical information such as surgical appointments, user accounts/passwords, clinical departments, and surgical procedures. Accessing videos from other hospital systems is also simple and smooth. We can offer a wide variety of scalable system configurations and storage capacity. Note 1: It can also support DVI, SDI, composite, and more with a video converter. Note 2: Please contact us for further details of compatible equipment. Please note that specifications, performance and technical data of the products are subject to change without prior notice. "OPELIO" is either trademarks or registered trademarks of Seventh Dimension Design, Inc.
Other company and product names are trademarks or registered trademarks of the respective companies.